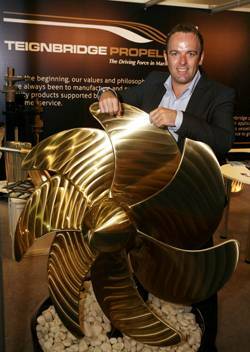 Chris Stokes, General Manager, Middle East, Teignbridge Propellers. UK’s Teignbridge Propellers score Middle East first with launch of new manufacturing arm; targets Africa, Asia and the Arab world In a first for the region, UK-headquartered Teignbridge Propellers International today unveiled plans to establish a manufacturing base in Dubai in order to support its existing operation and tap into new markets across the region and beyond. The UAE’s geographical location and established infrastructure is attracting high profile international maritime support companies looking to capitalise on first mover access to growth markets across Africa, Asia and the Middle East, with technological advancements in the industry on the agenda at the MiddleEast Workboats 2011 conference, organised by Seatrade. “This level of commitment to the region and the industry is indicative of the prominence of an event such as Middle East Workboats, which is a platform for announcements of this magnitude, and is attracting an increasing number of high profile companies like Teignbridge Propellers,” said Emma Hamilton, Marketing Manager Middle East, Seatrade. Headquartered in the Newton Abbot, Devon, in the UK, Teignbridge Propellers has been a market leader in the workboat support and servicing sector for 37 years - with a Middle East presence for over 18 years – and already has an established service and repair centre in Dubai. According to Chris Stokes, General Manager, Middle East, the move to set up a manufacturing plant is a natural evolution for the company, which is investing AED 6 million into its new 10,000 square foot Al Jadaf operation. The existing sales office and repair shop will relocate and be fully operational by the end of the year, with a dedicated on-site foundry ready by the end of Q1 2012. “This is an exciting time for the industry with a wealth of opportunities in emerging market destinations. As the only company in the Middle East offering bespoke marine propulsion manufacturing capabilities, this gives us a strong head start, along with the competitive advantage of a recognised UK brand name which is synonymous with quality,” said Stokes. Teignbridge is banking on securing a raft of new contracts for its new regional hub based on reduced lead-time capacity - with delivery time shortened by up to four weeks and a competitive pricing structure boosted by vastly reduced delivery costs. “We opted to set up our manufacturing base here, rather than in low cost centres such as the Philippines and India, for a number of reasons. This is an extremely attractive destination in terms of convincing top international talent to make the move out here, and Dubai, besides being a regional hub, was also a logical destination because of its high quality infrastructure reflecting our own quality-led reputation,” added Stokes. The company also plans to recruit locally, with a 60-strong team in place by year-end and the long-term objective of increasing manning to100 people as business takes off. Teignbridge Propellers, an exhibitor at Middle East Workboats 2011, manufactures and provides repair and support services for custom-made and standard propellers, along with stern gear for dhows, luxury yachts, tug boats and crew supply vessels within the commercial, leisure and military sectors.